Abstract: This study aims to improve the health of patients suffering from chronic fatigue syndrome (CFS) by interventions based on the biochemistry of the illness, specifically the function of mitochondria in producing ATP (adenosine triphosphate), the energy currency for all body functions, and recycling ADP (adenosine diphosphate) to replenish the ATP supply as needed. Patients attending a private medical practice specializing in CFS were diagnosed using the Centers for Disease Control criteria. In consultation with each patient, an integer on the Bell Ability Scale was assigned, and a blood sample was taken for the "ATP profile" test, designed for CFS and other fatigue conditions. Each test produced 5 numerical factors which describe the availability of ATP in neutrophils, the fraction complexed with magnesium, the efficiency of oxidative phosphorylation, and the transfer efficiencies of ADP into the mitochondria and ATP into the cytosol where the energy is used. With the consent of each of 71 patients and 53 normal, healthy controls the 5 factors have been collated and compared with the Bell Ability Scale. The individual numerical factors show that patients have different combinations of biochemical lesions. When the factors are combined, a remarkable correlation is observed between the degree of mitochondrial dysfunction and the severity of illness (P<0.001). Only 1 of the 71 patients overlaps the normal region. The "ATP profile" test is a powerful diagnostic tool and can differentiate patients who have fatigue and other symptoms as a result of energy wastage by stress and psychological factors from those who have insufficient energy due to cellular respiration dysfunction. The individual factors indicate which remedial actions, in the form of dietary supplements, drugs and detoxification, are most likely to be of benefit, and what further tests should be carried out. Key Words: Chronic fatigue syndrome, myalgic encephalomyelitis, mitochondria, neutrophils, oxidative phosphorylation. Chronic fatigue syndrome and mitochondrial dysfunction Int J Clin Exp Med (2009) 2, 1-16 2 experiment in many cases as we will see below. An alternative hypothesis (B) is that there is a metabolic dysfunction with the result that not enough energy is being produced. The main source of energy comes from the complete oxidation of glucose to carbon dioxide and water. The digestive system produces glucose, glycerol and fatty acids, and amino acids. If there is a problem with the digestive system, e.g. gut fermentation, hypochlorhydria or pancreatic insufficiency, energy production will be impaired and fatigue may result . These conditions can and should be tested for. Allergies and thyroid malfunction can also produce fatigue. When the digestive system is functioning properly glucose and lipids are fed into the blood stream where, together with oxygen bound to hemoglobin in erythrocytes (red blood cells), they are transported to every cell in the body. In the cytosol of each cell glucose is broken down in a series of chemical reactions called glycolysis into two molecules of pyruvate which enter the energy-producing organelles present in most cells of the body, the mitochondria. Some structural details and the number of mitochondria per cell are dictated by the typical energy requirements; cardiac and skeletal muscle cells and liver and brain cells contain the highest numbers. The mitochondria generate energy by oxidative metabolism in the form of ATP (adenosine triphosphate) which when hydrolysed to the diphosphate, ADP, releases energy to produce muscle contractions, nerve impulses and all the energy-consuming processes including the chemical energy needed to synthesise all of the complex molecules of the body [5, 6]. Thus, mitochondrial dysfunction will result in fatigue and can produce other symptoms of CFS. The two hypotheses are not mutually exclusive. Some patients may satisfy both. However there are constraints; the basal metabolic rate (about 7000 kJ per day) must be maintained and the first law of thermodynamics must not be violated. Chronic fatigue syndrome and mitochondrial dysfunction Int J Clin Exp Med (2009) 2, 1-16 3 criteria to be used in research projects that it funds. We use the term CFS or CFS/ME for the CDC criteria and ME/CFS for the Canadian criteria. Our study is aimed to assess the role of mitochondrial dysfunction with the primary aim of helping patients Hypothesis B is attractive because mitochondrial dysfunction in various organs offers possible explanations for many of the other symptoms of CFS and ME. There is mounting evidence that the symptoms are due to dysfunctions on the cellular level. Abnormalities have been seen in immune cells , and gene expression studies have revealed abnormalities in genes associated with immune cells, brain cells, skeletal muscle cells, the thyroid, and mitochondria [27, 28]. A further genetic study identified seven clinical phenotypes . There seem to be three distinct clusters of clinical abnormalities that define CFS : (a) blood flow and vascular abnormalities such as orthostatic intolerance (vascular system), (b) widespread pain, and high sensitivities to foods, temperature, light, noise and odours (central nervous system sensitization), and (c) fatigue, exhaustion and brain fog (impaired energy production). Hypothesis B is that the lack of energy in the third cluster originates in the mitochondria of individual cells. But mitochondrial dysfunction can also produce abnormalities (a) and (b) because ATP produced in each cell by its mitochondria is the major source of energy for all body functions. Figure 1. 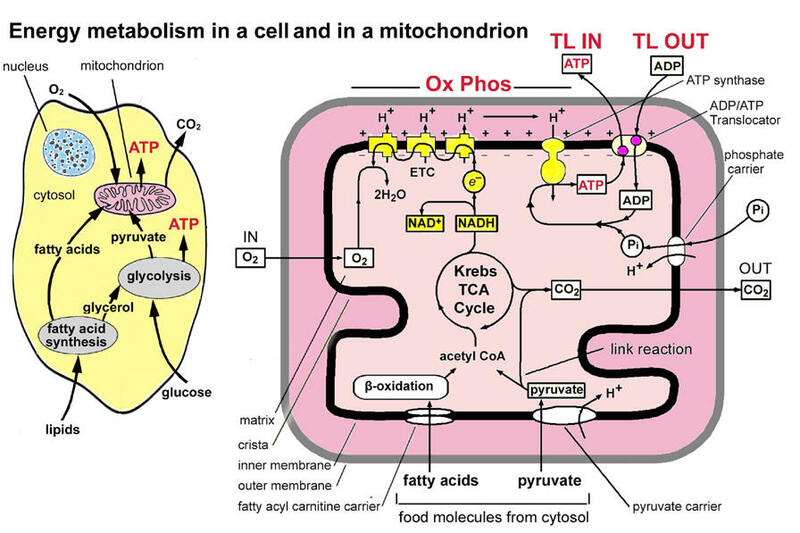 Main stages and location of energy metabolism in a human cell (left), and simplified details of a mitochondrion showing the main metabolic cycles and the oxidative phosphorylation respiratory chain (right). The outer mitochondrial membrane is highly permeable whereas the inner membrane is permeable only to water and gases. Special carrier and Translocator proteins pass reactants through it. At the top are the proteins involved in the respiratory electron transfer chain (ETC) and in the transfer of ATP and ADP between the cytosol and mitochondrion. ADP and Pi are combined by ATP synthase to make ATP. The ADP/ATP Translocator opens OUT to transfer ADP into the matrix and opens IN to transfer ATP to the cytosol. Nicotinamide adenine dinucleotide plays a key role in its oxidised form NAD+ and its reduced form NADH + H+ in carrying and transferring protons (H+) and electrons (e-). Adapted from:  and . textbooks, e.g. ). The ETC culminates with the protein complex ATP synthase which is effectively a reversible stepping motor in which 3 ATP molecules are produced from ADP and inorganic phosphate (Pi) every revolution . Because of evolutionary history ATP is made inside the mitochondrial inner membrane but used outside in the cytosol where it releases energy by converting to ADP and Pi. The Pi as a negative ion is co-transported back inwards together with H+, while ADP3- is transported inwards through the Translocator protein adenosine nucleotide translocase (TL or ANT) in exchange for ATP4- moving out into the cytosol. There are potential problems here because it is known that some specific molecules (e.g. atractyloside) block the transfer inwards and certain others can block transfer outwards , and there is the possibility that there may be other molecules including environmental contaminants which can block transfers. What happens if some part of these cellular metabolic pathways goes wrong? If the mitochondrial source of energy is dysfunctional many disease symptoms may appear  including the symptoms of CFS. Chronic fatigue syndrome and mitochondrial dysfunction Int J Clin Exp Med (2009) 2, 1-16 5 oxidation) and can last for only a few minutes. The increased acidity leads to muscle pain. Also, when the concentration of ADP in the cytosol increases and the ADP cannot be recycled quickly enough to ATP, another chemical reaction takes place. This becomes important if there is any mitochondrial dysfunction. Two molecules of ADP interact to produce one of ATP and one of AMP (adenosine monophosphate). The AMP cannot be recycled  and thus half of the potential ATP is lost. This takes some days to replenish and may account for the post-exertional malaise symptom experienced by patients [39-43]. Thus, mitochondrial dysfunction resulting in impaired ATP production and recycling is a biologically plausible hypothesis, and there is considerable evidence that it is a contributory factor in CFS, at least for a subset of patients. Our study may be considered to be a test of this hypothesis. Methods Participants Seventy-one patients, 54 female of average age 47 (range 14 to 75) and 17 male of average age 52 (range 20 to 86), were selected from a total of 116 consecutive patients attending a private medical clinic specializing in CFS/ME. Patients were excluded only if they did not meet the CDC diagnostic criteria for CFS  or if the "ATP profile" test had been made before they had been seen clinically. Evaluations, tests and interventions, where appropriate, were carried out for diet and sleep problems, allergies, and thyroid and adrenal problems. Advice on pacing was also given. After this stage a meeting was held with each patient at which an agreed numerical Ability was assigned and recorded in the clinical notes. The integral CFS Ability Scale  runs from 0 to 10 and is given in Appendix A. It was proposed to those patients who had not improved to an acceptable clinical level after these interventions that they have the "ATP profile" test done. All the participating patients had scores of 7 or less on the CFS Ability Scale. The nature of the test was explained and each patient agreed (and paid) for the "ATP profile" test (needing a 3-ml venous blood sample) to be performed. The laboratory carrying out the tests (Biolab Medical Unit, www.biolab.co.uk) was blinded to the Ability associated with any blood sample. As tests were carried out on more patients, it became clear that the "ATP profile" results were providing helpful information, and patients were asked to give written, informed permission for their test data to be used anonymously. All patients have done this. Blood samples from fifty-three normal, healthy volunteers were obtained by one of us (JMH) as Laboratory Director of Biolab until retirement from that position in 2007. Biolab obtained written permission with informed consent from each volunteer. The samples from the patient group and the normal (control) group were processed in the same way. The control group consisted of 40 females of average age 36 (range 18 to 63) and 13 males of average age 35 (range 18 to 65). For both groups all procedures were consistent with the Declaration of Helsinki (2000) of the World Medical Association (www.wma.net) and this report follows the guidelines of the International Committee of Medical Journal Editors (icmje.pdf available at www.icmje.org). Procedures ATP is present in cells mainly as a complex with magnesium and is hydrolysed to the diphosphate (ADP) as the major energy source for muscle and other tissues. ADP conversion to ATP within mitochondria can be blocked or partially blocked by some environmental contaminants. Specifically, the TL in the mitochondrial membrane that controls the transfer of ADP from the cytosol and ATP to the cytosol may be chemically inhibited and its efficiency is also pH dependent. Changes in acid:base balance, magnesium status, and the presence of abnormal metabolic products can have similar effects to xenobiotic inhibition of the TL. Maar niet bij iedere patient wordt zo gevonden dat de mt niet goed werkt. Duidelijk is wel dat de meerderheid beneden het minimum zit. De ATP ratio afwijking is juist sterker bij patienten met matige vermoeidheidsklachten. Bij de Translocator-IN is te zien dat deste heftiger de vermoeidheid benoemd wordt door de patient deste minder optimaal de TL-IN werking is gemiddeld. Bij deze metingen is te zien dat een groot deel van deze groep duidelijk beneden het minimum zit. Maar ook een deel daarboven. Figure 2. 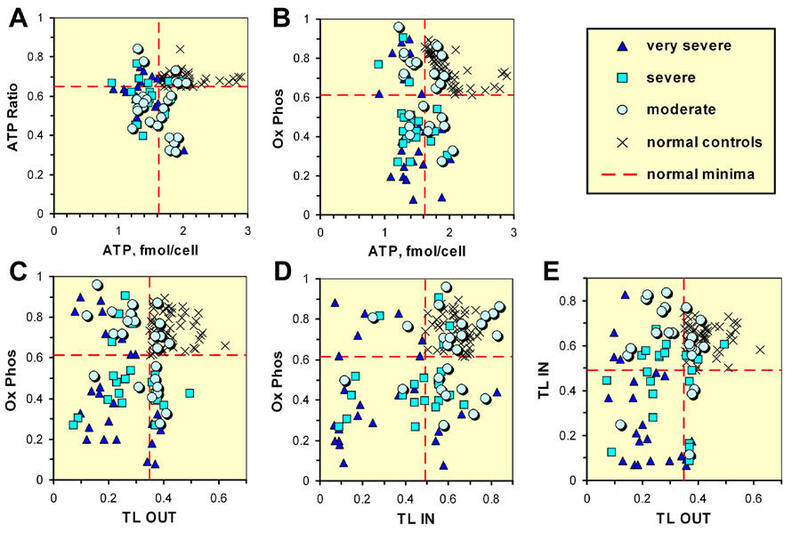 Scatter plots of the 5 factors (A to E) measured in the "ATP profile" test vs. CFS Ability. In the middle are stacked projection histograms of the 3 categories of the patient group, and on the right projection histograms of the control group. The heavy horizontal dashed lines correspond to the minimum value of each factor measured for the control group. phagocytosis in neutrophils . 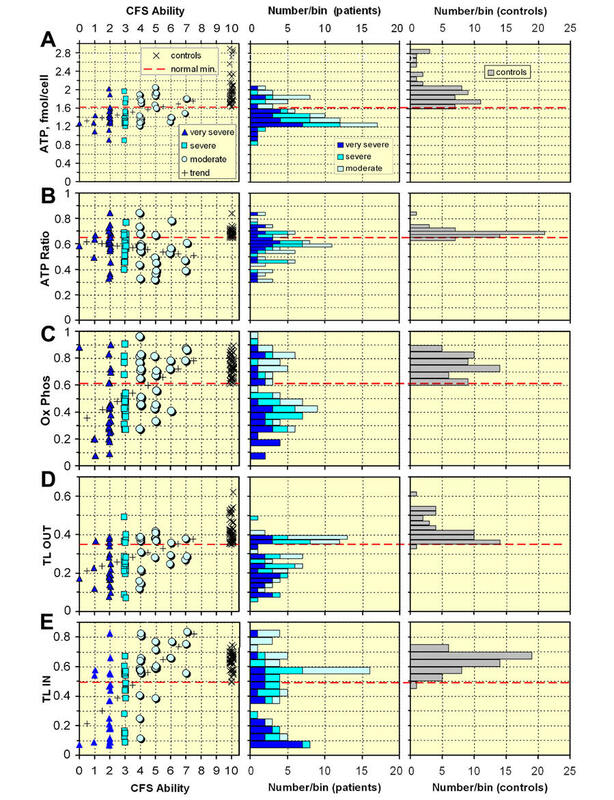 The stacked histogram for the patients and the Ability plot clearly show that some patients are in the normal region and some are below and they split into two groups with very little overlap. Rather than comparing the patients with the average of the normal control group which is customary, we prefer to compare with the minimum value of the control group which is more cleanly defined. Also, this method permits us to classify patients as being in the normal region or being below the normal region. Clearly this can be changed easily and all the numbers are given in Figure 2. We therefore show as a heavy horizontal dashed line the minimum value of each factor measured for the controls. 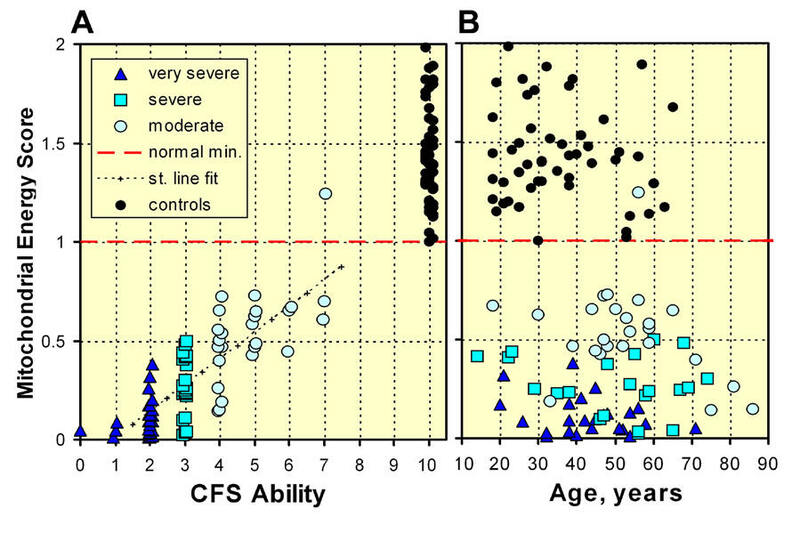 Figure 2A, ATP vs. CFS Ability, shows that the majority of the "very severe" and "severe" patients are below the normal minimum but very few are below 75% of this minimum. Note that 3 of the "very severe" patients are well into the normal region; they have problems with one or more of the 4 other factors. Just over 50% of the "moderate" patients are in the normal region. There is a small positive correlation which is indicated by the "trend" crosses. There is not a gentle increase in ATP with Ability, but an increase in the fraction of patients above the normal minimum line. Figure 2B shows ATP Ratio vs. CFS Ability. The majority of patients in all 3 categories are below the normal minimum, and about 1/3 of "moderate" patients are below 75% of the normal minimum. The correlation with Ability is slightly negative. Values for the normal controls are rather tightly grouped with a minimum of 0.65 and average of 0.69. The Ox Phos plot in Figure 2C shows a wide range of values and a strong positive correlation for this factor for the patient group. The stacked projection clearly shows that there are two groups – above and below the normal minimum and the upper group spans a similar range to the controls. Note the high value for the sole patient with CFS Ability = 0. This patient also has ATP = 1.26 and ATP Ratio = 0.59 which are not very far below the normal minima. The TL OUT plot of Figure 2D also shows two groups with a rather sharp peak in the stacked projections just above the normal minimum and this closely matches the projection of the control group. Many patients, particularly the "very severe", are far below the normal minimum. The TL IN plot of Figure 2E also has a peak in the normal region. However, some patients have very low values, including the patient with CFS Ability = 0. The product TL OUT × TL IN is only 0.012 for this patient who is very severely ill whereas this product is 0.17 at the normal minima, a factor of 14 larger. If just ATP or Ox Phos had been measured the very severe mitochondrial dysfunction of this patient would not have been detected. Note the strong positive correlation for TL IN. Most patients are below normal in more than one factor (average [range] is 3.7 [2 to 5] for "very severe", 3.5 [2 to 5] for "severe" and 2.2 [1 to 4] for "moderate"). Some of the features are summarised numerically in Table 1. For most of the factors the percentage of patients who are in the normal region increases in going from "very severe" to "severe" and to "moderate". The exception is the ATP Ratio which gently decreases, but within the statistical errors is constant. Both TL IN and the product TL OUT × TL IN increase by large factors. For patients in the "moderate" category the main influence on their illness appears to be the ATP Ratio. Table 1 also illustrates the importance of measuring more than one factor. For example, if only ATP had been measured, 28% of all the patients would be classified as normal, and if only Ox Phos had been measured, 32% of the "very severe" patients would be classified as normal. Correlations between numerical factors It is also helpful to look at correlations between pairs of numerical factors. The five most relevant examples are shown in Figure 3. In the scatter plots of Figure 3 the normal region is the rectangular region in the upper right corner defined by the normal minima dashed lines. In the ATP Ratio vs. ATP plot (Figure 3A) most patients are fairly close to the normal region apart from the small cluster at ATP Ratio ~ 0.35. Chronic fatigue syndrome and mitochondrial dysfunction Int J Clin Exp Med (2009) 2, 1-16 9 normal region for both factors. Some of the "very severe" and "severe" patients are in the normal region for Ox Phos and some are far below. Note the apparent negative correlation for the normal controls. This shows that for normal subjects there is a compensatory mechanism, i.e. if ATP is high Ox Phos is low and vice versa. This is expected because the ATP concentration is a major factor in the control of the rate of the ox-phos process and the energy supply is adjusted to meet the energy demand. There is no obvious evidence for this effect in the patient group. Figure 3. Scatter plots of correlations between pairs of factors measured in the "ATP profile". The errors shown are ±1 SD (Standard Deviation), computed with the binomial distribution. The biochemical measurements in the "ATP profile" separate the energy generation and recycling processes into 5 steps. As in any multistep process, for example electrical power production or an assembly line, the efficiency of the overall process is the product of the efficiencies of the individual steps. Any suggestion of relative weighting is irrelevant; it only results in an overall normalization factor. The product of ATP and ATP Ratio is the cellular concentration of ATP complexed with magnesium and this is the available energy supply of ATP. Ox Phos is the efficiency of the ETC which converts ADP into ATP. However, for the recycling of ADP to make more energy available the Translocator protein must efficiently have its binding site facing out to collect ADP (TL OUT) and alternately facing in (TL IN) to efficiently transmit ATP from the mitochondria into the cytosol where its energy can be used. We have found it useful to calculate the product of the five factors, the overall mitochondrial energy-producing relative efficiency, and call it the Mitochondrial Energy Score. We just multiply the 5 factors together for each patient and each control. The minimum value for the controls is 0.182 fmol/cell. We have chosen this as our normalisation point so we divide all the Energy Scores (for both patients and controls) by this value. Thus all controls have Mitochondrial Energy Score ≥ 1.00. A scatter plot of the Energy Score for each patient at each value of CFS Ability and each control is shown in Figure 4A. The horizontal dashed line indicates the minimum value for the normal controls and this is our normalization value of 1.00. Only one of the 71 patients has an Energy Score > 1 (namely 1.25 for one of the patients with Ability = 7). However this patient has 2 of the 5 factors below the normal minima. Hier is de som te zien van de vijf metingen per patient. samen met het symbool van de door de patient zelf benoemde vermoeidheidsgraad. Samen met de controle groep. Figure 4. The Mitochondrial Energy Score. A. The Energy Score plotted against CFS Ability with a point for each patient. A point for each control is plotted at CFS Ability = 10. The horizontal dashed line at Energy Score = 1.00 is our normalisation at the minimum Energy Score for controls. Also shown is the best straight line fit to the patient data. B. The Energy Score plotted vs. Age of patients and controls. *R2 (called the "coefficient of determination" or the "explained variation") is the square of the product moment correlation coefficient. † There are 71 data points and 2 parameters, slope and intercept. limit is still several Standard Errors above zero. Figure 4B there is no evidence for age dependence in the control group but the maximum age is only 65 years (points for three controls have been omitted because their Energy Score is more than 2.00 with a maximum of 2.83). There are six patients of age ≥ 70, one very severe with Ability = 2, one "severe" with Ability = 3, and four "moderate" who all have Ability = 4. These four patients have Energy Scores which are below the average (0.42) for this Ability so there may well be a decrease with increasing age. On the other hand there is a 33-year old patient who also has Ability = 4 and is well below the average. Excluding the six patients of age ≥ 70 slightly improves the straight line fit (R2 = 0.677) but has negligible effect on the other parameters or our conclusions. The "ATP profile" results indicate mitochondrial dysfunction of the neutrophils in the patients in our cohort, and moreover the degree of dysfunction is strongly correlated with the severity of their illness. Neutrophils are the major effector cells of the immune system and the observed mitochondrial dysfunction is bound to have a deleterious effect on this system. We note that increased apoptosis of neutrophils has been observed previously in people with CFS . Mitochondria are important functional parts of almost all human cells but we cannot assert from the present study that the mitochondria in other cells are dysfunctional to the same degree; human biology provides energy to vital organs at the expense of less important parts. However, dysfunction in heart muscle cells and in central nervous system cells could explain respectively the vascular and central sensitization clusters of clinical abnormalities mentioned in the Introduction. Thus, our results strongly suggest that the immediate cause of the symptoms of CFS/ME is mitochondrial dysfunction. We cannot overemphasize the importance of a careful diagnosis using the CDC criteria , or even better the Canadian criteria which more precisely describe the symptoms . (An abridged version designed for health professionals, patients and carers is available at www.mefmaction.net/Patients/Overviews/ tabid/122/Default.aspx). It is doubtful that patient selection with less selective criteria would yield the high degree of correlation observed here. The ways that the individual factors in the Mitochondrial Energy Score behave show that not all patients are affected in the same way. This may be due to the heterogeneous nature of the precipitating agents or to variations in the way patients react to them. The results indicate specific biochemical lesions and some of these may be amenable to ameliorative intervention. Mitochondria need all of their essential vitamins, minerals, essential fatty acids and amino acids to function properly [31-33]. From the clinical point-of-view of helping patients this is very important; the typical time-consuming hit-or-miss protocol can be replaced by interventions based on biochemical information and understanding . We have demonstrated the power and usefulness of the "ATP profile" test in confirming and pin-pointing biochemical dysfunctions in people with CFS. Our observations strongly implicate mitochondrial dysfunction as the immediate cause of CFS symptoms. However, we cannot tell whether the damage to mitochondrial function is a primary effect, or a secondary effect to one or more of a number of primary conditions, for example cellular hypoxia , or oxidative stress including excessive peroxynitrite [54-58]. Mitochondrial dysfunction is also associated with several other diseases and this is not surprising in view of the important role of mitochondria in almost every cell of the body, but this fact appears to have been recognised only in recent years [34, 38, 59, 60]. The observations presented here should be confirmed in a properly planned and funded study. The biochemical tests should be done on CFS patients after, as well as before, appropriate interventions and possibly on patients with other disabling fatigue conditions. It would also be good to confirm the biochemical test results in a second (perhaps government-supported) laboratory. This scale is a useful and sensitive measure of the level of activity and ability to function of patients with CFS/ME . It is similar to the Energy Index Point Score (EIPS™, www.cfsviraltreatment.com) . It runs from 0 to 10 with: 0. Severe symptoms on a continuous basis; bedridden constantly; unable to care for self. 1. Severe symptoms at rest; bedridden the majority of the time. No travel outside of the house. Marked cognitive symptoms preventing concentration. 2. Moderate to severe symptoms at rest. Unable to perform strenuous activity. Overall activity 30-50% of expected. Unable to leave house except rarely. Confined to bed most of day. Unable to concentrate for more than 1 hour per day. 3. Moderate to severe symptoms at rest. Severe symptoms with any exercise; overall activity level reduced to 50% of expected. Usually confined to house. Unable to perform any strenuous tasks. Able to perform desk work 2-3 hours per day, but requires rest periods. 4. Moderate symptoms at rest. Moderate to severe symptoms with exercise or activity; overall activity level reduced to 50-70% of expected. Able to go out once or twice per week. Unable to perform strenuous duties. Able to work sitting down at home 3-4 hours per day, but requires rest periods. 5. Moderate symptoms at rest. Moderate to severe symptoms with exercise or activity; overall activity level reduced to 70% of expected. Unable to perform strenuous duties, but able to perform light duty or desk work 4-5 hours per day, but requires rest periods. 6. Mild to moderate symptoms at rest. Daily activity limitation clearly noted. Overall functioning 70% to 90%. Unable to work full time in jobs requiring physical labour (including just standing), but able to work full time in light activity (sitting) if hours flexible. The "ATP profile" tests were developed and carried out at the Biolab Medical Unit, London, UK (www.biolab.co.uk), where one of us (JMH) was Laboratory Director until retirement in 2007. Blood samples in 3-ml heparin tubes were normally received, tested and processed within 72 hours of venepuncture. We briefly describe here the 3 series of measurements, (A), (B) and (C) and how the 5 numerical factors are calculated. (Step-by-step details can be obtained by contacting JMH at acumenlab@hotmail.co.uk). Neutrophil cells are separated by HistopaqueTM density gradient centrifugation according to Sigma® Procedure No. 1119 (1119.pdf available at www.sigmaaldrich.com). Cell purity is checked using optical microscopy and cell concentration is assessed using an automated cell counter. Quantitative bioluminescent measurement of ATP is made using the Sigma® Adenosine 5’-triphosphate (ATP) Bioluminescent Somatic Cell Assay Kit (FLASC) according to the Sigma® Technical Bulletin No. BSCA-1 (FLASCBUL.pdf). In this method ATP is consumed and light is emitted when firefly luciferase catalyses the oxidation of D-luciferin. The light emitted is proportional to the ATP present, and is measured with a Perkin-Elmer LS 5B Fluorescence Spectrometer equipped with a flow-through micro cell. Sigma® ATP Standard (FLAA.pdf) is used as a control and as an addition-standard for checking recovery. Similar kits are available from other providers, e.g. the ENLITENTM ATP Assay System (Technical Bulletin at www.promega.com), and dedicated instruments are now available, e.g. Modulus Luminescence Modules (see Application Note www.turnerbiosystems.com/doc/appnotes /PDF/997_9304.pdf). (A). ATP is first measured with excess magnesium added via Sigma® ATP Assay Mix giving result a. This is the first factor, the concentration of ATP in whole cells, ATP = a in units of nmol/106 cells (or fmol/cell). analogous reagents produced in-house without added magnesium, giving result b in the same units. The ratio, c = b/a, is the second factor, the ATP Ratio. (B). In order to measure the ADP to ATP conversion efficiency via the ox-phos process, the ATP (with excess magnesium) result, a, is used and then the conversion is inhibited in the laboratory with sodium azide for 3 min and result d is obtained (also with excess magnesium). The laboratory inhibitor is then removed by washing with buffered saline and the mitochondria should rapidly replete (again 3 min) the ATP supply from ADP. This gives result e in the same units. The conversion efficiency Ox Phos is f = [(e – d) / (a – d)]. (C). In order to measure the effectiveness of the Translocator (TL) in the mitochondrial membrane the cells are ruptured and the mitochondria are trapped onto pellets of an affinity chromatography medium doped with a low concentration of atractyloside. This immobilises the mitochondria while the other cell components are washed away. The buffers used then free the mitochondria leaving the atractyloside on the solid support that plays no further part in the method. The mitochondrial ATP concentration is measured giving result g in units of pmol/million cells. For the next measurement some pellets are immersed in a buffer (which acts as an artificial cytosol) containing ADP at pH = (5.5 ± 0.2) which biases the TL towards scavenging ADP to be converted to ATP in the mitochondria. After 10 min the ATP is measured again, giving result h in the same units. The factor TL OUT is the fractional increase in ATP j = [(h – g) / g]. For the next measurement pellets are immersed in a buffer not containing ADP and the TL is biased away from ADP pickup and towards ATP transfer into the artificial cytosol at pH = (8.9 ± 0.2) After 10 min the mitochondrial ATP is again measured giving result k, and the factor TL IN is the fractional decrease l = [(g – k) / g]. This decreased activity of ANT results in reduced ATP available for cellular energy production. Again, after treatment of aged rats with ALC, the scientists found that ADP transport of rat heart mitochondria was restored to the level of young rats . Bij een jongen die op 3,5-jarige leeftijd voor het eerst werd verwezen wegens snelle vermoeidheid en trage motorische ontwikkeling werd na uitgebreid onderzoek een deficiëntie vastgesteld van de adenine-nucleotide-translocator in spierweefsel, een mitochondriale metabole stoornis. Met hooggedoseerde vitamine E werd een opmerkelijke verbetering bereikt (follow-up tot een leeftijd van 11 jaar), maar patiënt bleef een hoge serumlactaatconcentratie houden. Zie ook de artikelen op bl. 1322 en 1327. In rust en onder normale omstandigheden leveren de mitochondriën meer dan 95% van de benodigde energie van de cel (de rest wordt geleverd door de glycolyse). De oxidatie, dat is verbranding, van vetzuren, pyruvaat, aminozuren en Krebs-cyclus-intermediaren door zuurstof tot water en koolstofdioxide, levert de energie waardoor uiteindelijk in de mitochondriën adenosine-difosfaat (ADP) met fosfaat kan worden omgezet in adenosine-trifosfaat (ATP). Bij deze oxidatieve fosforylering worden de elektronen van oxideerbare substraten via de enzymen van de ademhalingsketen (de complexen I-IV) naar zuurstof getransporteerd, waarbij een protongradiënt wordt gecreëerd over de mitochondriale binnenmembraan. Die gradiënt is de drijvende kracht achter de fosforylering van ADP tot ATP. De binnen het mitochondrion geproduceerde ATP wordt naar buiten getransporteerd, in ruil voor ADP uit de cytosol. Dit proces wordt gekatalyseerd door de adenine-nucleotide-translocator. In spiercellen wordt het ATP in de cytosol voor een groot deel door mitochondriaal creatinekinase omgezet in de hoogenergetische verbinding creatinefosfaat. Hierdoor kan elders in de cel waar creatinekinase uit de cytosol aanwezig is (maar geen mitochondriën) ADP worden omgezet in de benodigde ATP. Wij beschrijven de diagnostische speurtocht bij een jongen die snel moe werd en een sterk verhoogde melkzuurconcentratie in het serum had. Uiteindelijk werd bij hem een deficiëntie van de adenine-nucleotide-translocator vastgesteld; behandeling met vitamine E was succesvol. Patiënt A, een jongen, het tweede kind van gezonde, niet-consanguïene ouders, werd verwezen op de leeftijd van 3,5 jaar wegens kortademigheid en snelle vermoeidheid. Vanaf de geboorte had hij een normale geestelijke ontwikkeling (op school presteerde hij later goed), maar was hij traag in zijn motorische ontwikkeling. Hij begon pas te lopen op de leeftijd van 18 maanden en was daarna sterk afhankelijk van een rolstoel. Zijn spieren waren licht dystrofisch, maar hadden een normale tonus. De functies van longen, nieren, hart, lever en van het visuele systeem waren normaal. In het serum was de melkzuurconcentratie sterk verhoogd: 11,8 mM (normaal < 2,0), evenals de concentraties van pyrodruivenzuur: 151 µM (normaal: 41-70) en alanine: 453 µM (normaal: 150-300). In de liquor waren de melkzuur- en alanineconcentraties ook verhoogd, respectievelijk 3,3 mM (normaal < 1,8) en 38 µM (normaal: 12-32). De uitscheiding van melkzuur en ketonlichamen in de urine was eveneens abnormaal hoog. De vrije en totale carnitineconcentratie in bloed en urine was normaal. Wanneer de lever en de hersenen goed functioneren, en glycogeen normaal aanwezig is in de spier, zoals bij onze patiënt, is een defect van de eerstgenoemde groep mitochondriale enzymen het waarschijnlijkst. Het kan gaan om een mutatie in mitochondriaal DNA of in kern-DNA, of om het gevolg van een tekort aan componenten nodig voor de oxidatieve fosforylering (zuurstof, fosfaat, B-vitaminen, et cetera). Wegens de ernst van de aandoening werd een spierbiopt genomen, uit de M. quadriceps. Histologisch onderzoek liet een normale verdeling zien van glycogeen en vetdruppels. Histochemisch onderzoek toonde een toename aan van het aantal mitochondriën onder het sarcolemma, maar er werden geen ‘ragged red fibers’ gezien, die vaak worden waargenomen in de spier bij stoornissen in de oxidatieve fosforylering. Elektronenmicroscopische analyse toonde gezwollen mitochondriën met soms vergrote aantallen parallel of concentrisch verlopende cristae. Biochemisch onderzoek van het spierbiopt toonde een verhoogde activiteit van alle gemeten mitochondriale enzymen, en kon zodoende de melkzuuracidose niet verklaren. Hoewel de oorzaak van de aandoening bij de patiënt niet duidelijk was, werd getracht hem te behandelen volgens een eerdere publikatie met levocarnitine (2 gdag), thiamine (B1) (300 mgdag), riboflavine (B2) (20 mgdag), nicotinamide (B3) (150 mgdag), biotine (B7) (20 mgdag), pantotheenzuur (B5) (50 mgdag) en liponzuur (10 mgdag). Geleidelijk trad een duidelijke verbetering op van de klinische toestand met een daling van de melkzuurconcentratie in het serum tot 5-7 mM. Op de leeftijd van 7 jaar, 2 jaar na de start van de behandeling, verminderde de klinische toestand van patiënt opnieuw en steeg de melkzuurconcentratie weer in het serum. Besloten werd tot een tweede spierbiopsie voor onderzoek van intacte mitochondriën, zodat behalve de activiteit van verschillende enzymen ook de energieproduktie onderzocht kon worden. De activiteiten van verschillende enzymen betrokken bij de mitochondriale energiehuishouding waren nog steeds verhoogd, maar de mitochondriale energieproduktie bleek ernstig gestoord te zijn. Dit werd bevestigd door de verlaagde verhouding tussen creatinefosfaat en ATP, die werd gemeten met 31P-kernspinresonantie-spectroscopie in de skeletspier van de rechter onderarm (1,5 Tesla, S 15HP gyroscan unit; Philips Medical Systems, Best, Nederland). Met deze techniek wordt de verhouding tussen anorganisch fosfaat en fosfaatesters (vooral creatinefosfaat en ATP) gemeten. Na staken van alle medicatie verbeterde de eetlust van de patiënt, maar de melkzuurwaarde in het serum steeg opnieuw tot 12,7 mM en die van pyrodruivenzuur tot 268 µM. Het spectroscopisch onderzoek suggereerde eveneens dat de mitochondriale functie verslechterde. Patiënt was inmiddels oud genoeg om ook een inspanningstest te ondergaan, waarbij de verdwijning en de resynthese van creatinefosfaat gemeten worden. De snelheid waarmee de resynthese plaatsvindt, is een maat voor de snelheid van de oxidatieve fosforylering. Deze bleek verlaagd te zijn. Uitgebreid biochemisch onderzoek toonde vervolgens aan dat patiënt een deficiëntie van de adenine-nucleotide-translocator had, en wel de door kern-DNA gecodeerde spierspecifieke vorm ervan. Hoewel immunologisch de eiwitconcentratie van de subeenheden van het mitochondriale complex IV sterk was toegenomen, was de activiteit ervan achtergebleven, en bovendien was deze in het tweede biopt lager dan in het eerste. Omdat dit zou kunnen komen door inactivering van complex IV door peroxidatie van de onverzadigde vetzuren in cardiolipine, werd gestart met toediening van grote hoeveelheden vitamine E, aanvankelijk 1,0 gdag, later 0,6-0,8 gdag. (Cardiolipine is een verbinding die onverzadigde vetzuren bevat en uitsluitend in de mitochondriale binnenmembraan voorkomt. Het is bekend dat de activiteit van complex IV geremd wordt wanneer cardiolipine geperoxideerd wordt. Peroxidatie is een gevolg van een verhoogde concentratie aan vrije radicalen. Vandaar de poging tot behandeling met vitamine E: deze verbinding kan vrije radicalen wegvangen.) Hierop trad een aanzienlijke verbetering in van het uithoudingsvermogen. De patiënt had zijn rolstoel alleen nog nodig voor lange afstanden en kon voor het eerst zelfstandig op straat spelen. De verschillende therapeutische pogingen bij deze patiënt werden gevolgd met behulp van 31P-kernspinspectroscopie: in rustende spier steeg de molaire verhouding tussen creatinefosfaat en ATP van 1,70 (vóór vitamine E-therapie) tot 1,86 na 10 weken vitamine E-therapie en tot 1,93 na 10 maanden therapie. De snelheid waarmee creatinefosfaat door oxidatieve fosforylering weer werd aangemaakt na inspanning verdubbelde tijdens de behandeling met vitamine E: er werd een stijging gevonden van 19 tot 33 van de gemiddelde referentiesnelheid na 10 weken therapie, en tot 38 van de referentiewaarde na 10 maanden behandeling. De melkzuurconcentratie in bloed, gemeten in rust, daalde echter niet significant. Bij biochemisch onderzoek van het homogenaat van het eerste spierbiopt werden de enzymen getest, waarvan deficiëntie een verklaring zou kunnen geven voor de melkzuuracidose. De activiteit van enzymen die de oxidatieve fosforylering zelf verzorgen (complex I-V) en de activiteit van een tweetal mitochondriale enzymen (pyruvaatdehydrogenase en 2-oxoglutaraatdehydrogenase) die betrokken zijn bij de aanmaak van substraten voor de oxidatieve fosforylering, bleek echter niet verlaagd maar verhoogd te zijn. De activiteit van complex IV was het minst verhoogd, en die van pyruvaatdehydrogenase het meest (20 x). De carnitineconcentratie en de totale (dat is mitochondriale plus cytosolische) creatinekinaseactiviteit waren normaal. De carnitineconcentratie is van belang omdat bij mitochondriale aandoeningen heel vaak een verlaagde carnitineconcentratie wordt waargenomen; dit was echter bij onze patiënt niet het geval. Het gehele spectrum van veranderde mitochondriale enzymactiviteiten was zo uitzonderlijk, dat wij beseften met een bijzonder defect te maken te hebben. In het tweede spierbiopt (afgenomen tijdens behandeling met de diverse vitaminen) waren de activiteiten van diverse mitochondriale enzymen nog steeds verhoogd, maar de activiteit van complex IV bedroeg slechts 122 van de gemiddelde referentiewaarde; in het eerste biopt was dat nog 186. De mitochondriale capaciteit om pyruvaat te verbranden was sterk verhoogd wanneer de oxidatie niet afgemeten werd aan de produktie van ATP. Dit was in overeenstemming met de sterk verhoogde activiteit van de enzymen van de ademhalingsketen. Wanneer echter gekeken werd onder condities waarbij de oxidatie van substraten gekoppeld was aan ATP-produktie bleken de oxidatiesnelheid en de energieopbrengst laag te zijn. Hieruit werd geconcludeerd dat de patiënt een ernstig defect in de oxidatieve fosforylering had, waarbij niet de oxidatie, maar wel de fosforylering het probleem leek te zijn. Het defect was echter waarschijnlijk niet te wijten aan deficiëntie van complex V, het ATP-synthase, omdat de activiteit van dit enzym ook sterk verhoogd was, vergeleken met referentiewaarden, evenals de hoeveelheid eiwit van het enzym. Een tweede mogelijkheid om de gevonden uitslagen te verklaren was een deficiëntie van de adenine-nucleotide-translocator ANT, het eiwit dat het transport van ATP uit de mitochondriën moet verzorgen. Immunologisch onderzoek van het tweede spierbiopt toonde aan dat de hoeveelheid van dit eiwit sterk verlaagd was (figuur). Patiënt had dus een tekort van adenine-nucleotide-translocator. Om na te gaan of het defect ook in andere weefsels van patiënt voorkwam, werden gekweekte huidfibroblasten en lymfocyten onderzocht (dr.R.J.A.Wanders, Laboratorium Procreatie, Academisch Medisch Centrum (AMC), Amsterdam). De synthese van ATP uit ADP en fosfaat werd gemeten met behulp van diverse oxidatieve substraten. De bevindingen toonden in alle gevallen een normale ATP-synthese. Verder onderzoek liet zien dat ook de hoeveelheid adenosine-nucleotide-translocator normaal was in deze cellen. Dit maakt het des te aannemelijker dat er een direct verband bestaat tussen de verstoorde ATP-produktie en de verminderde hoeveelheid adenine-nucleotide-translocator in de spier van de patiënt. Onderzoek naar het primaire genetische defect dat leidde tot de vermindering van de hoeveelheid adenine-nucleotide-translocator (dr.P.A.Bolhuis et al., Laboratorium Neurozintuigen, AMC, Amsterdam) toonde aan dat de hoeveelheid boodschapper-RNA (mRNA) afkomstig van het gen voor de spierspecifieke adenine-nucleotide-translocator ook verminderd was, en dus dat er waarschijnlijk iets mis was met de expressie van dit gen.
Een deficiëntie van de spierspecifieke vorm van de adenine-nucleotide-translocator is een nieuwe oorzaak voor mitochondriale myopathie met melkzuuracidose. Hierdoor kan het ATP de mitochondriën niet uit en ADP er niet in. Dit leidt tot een tekort aan ATP (en creatinefosfaat) en verhoogd ADP in de cytosol, en verklaart de verminderde spierfunctie. De melkzuuracidose kan eveneens verklaard worden door dit defect: de hoge ATP-concentraties in de mitochondriën remmen de oxidatie van substraten zoals pyruvaat en NADH, afkomstig uit de glycolyse; beide zullen in melkzuur worden omgezet. De verhoogde activiteit van de gemeten mitochondriale enzymen in de spier is waarschijnlijk een secundair effect: verhoogde proliferatie van mitochondriën of een versterkte aanmaak van mitochondriale enzymen wordt vaker waargenomen bij patiënten met mitochondriale myopathieën en wordt beschouwd als een compensatiemechanisme bij een verminderde functie van mitochondriën. De ernst van de gestoorde mitochondriale energieproduktie wordt geïllustreerd door het hoge melkzuurconcentratie in het bloed en door de resultaten van de fosfor-kernspinspectroscopie van de skeletspier. Een vermindering van de creatinefosfaatspiegels tot 50 in de rustende spier wordt alleen waargenomen bij ernstige stoornissen van de energiehuishouding. Het gevolg is een verhoogde melkzuurproduktie in de spier van de patiënt, het teveel aan melkzuur wordt afgevoerd naar het bloed. De verhoogde melkzuurconcentratie in de liquor (hersenvocht) is waarschijnlijk het gevolg van ‘overflow’ uit het bloed. Aangezien vrije radicalen continu worden gevormd door normale fosforylerende mitochondriën, is het waarschijnlijk dat bij een sterke toename van het aantal mitochondriën meer vrije radicalen worden gevormd, en dat dit nog wordt verhoogd bij een defecte oxidatieve fosforylering door de hogere zuurstofconcentratie en ook door de aanwezigheid van reactieve gereduceerde intermediairen van de ademhalingsketen. Hierdoor kunnen de beschermingsmechanismen tegen vrije radicalen in de spiercel tekort gaan schieten. Een van de manieren waarop de verhoogde vrije radicalen zich kunnen manifesteren, is door peroxidatie van lipiden. Dat de lipidenperoxidatie in de spier van de patiënt was toegenomen, werd gesuggereerd door de verlaagde complex IV-activiteit. Dit verklaart mogelijk ook het gunstige effect van vitamine E: deze verbinding is in staat om vrije radicalen weg te vangen. Bij follow-up-onderzoek na 36 maanden behandeling met vitamine E ging het met patiënt nog steeds goed en waren zijn motorische prestaties een verrassing voor iedereen die hem van vroeger kende. Deze eerste demonstratie van de behandeling van een patiënt met een mitochondriale myopathie en gestegen mitochondriënaantal met hoge doses vitamine E kan belangrijk zijn bij de therapie van soortgelijke patiënten met de veel frequenter voorkomende stoornissen in de complexen I of IV. Financiële steun aan dit onderzoek werd gegeven door Het Prinses Beatrix Fonds, Den Haag. De patiënt uit dit artikel werd eerder beschreven in Pediatric Research (1993;33:412-7) onder de titel 'Deficiency of the adenine nucleotide translocator in muscle of a patient with myopathy and lactic acidosis: a new mitochondrial defect', in Journal of Inherited Metabolic Disease (1993;16:548-52) onder de titel 'Adenine nucleotide translocator deficiency in muscle: potential therapeutic value of vitamin E', en in Lancet (1993;342:175-6) onder de titel 'Vitamin E in a mitochondrial myopathy with proliferating mitochondria [letter]'. Academisch Medisch Centrum, Meibergdreef 9, 1105 AZ Amsterdam. Emma Kinderziekenhuishet Kinder AMC, afd. Kindergeneeskunde: dr.H.D.Bakker, kinderarts. Laboratorium Neurozintuigen: dr.C.van den Bogert, celbioloog. Laboratorium Procreatie: dr.A.H.van Gennip, klinisch chemicus. Erasmus Universiteit, afd. Biochemie, Rotterdam. Prof.dr.H.R.Scholte, biochemicus. Universiteitskliniek Wilhelmina Kinderziekenhuis, afd. Klinische Chemie, Utrecht. Dr.J.A.L.Jeneson, biochemicus. Academisch Ziekenhuis, afd. Kindergeneeskunde, Nijmegen. Dr.W.Ruitenbeek, biochemicus. Correspondentieadres: dr.H.D.Bakker. Meijer AJ, Noorden CJF van. Celbiologie in medischperspectief. VI. Energievoorziening van de cel.Ned Tijdschr Geneeskd 1991;135:2164-70. Scholte HR. The biochemical basis of mitochondrialdiseases review. J Bioenerg Biomembr 1988;20:161-91. Przyrembel H. Therapy of mitochondrial disorders. JInherit Metab Dis 1987;10 Suppl 1:129-46. Bakker HD, Scholte HR, Bogert C van den, Ruitenbeek W,Jeneson JA, Wanders RJA, et al. Deficiency of the adenine nucleotidetranslocator in muscle of a patient with myopathy and lactic acidosis: a newmitochondrial defect. Pediatr Res 1993;33(4 Pt 1):412-7. Arnold DL, Matthews PM, Radda GK. Metabolic recovery afterexercise and the assessment of mitochondrial function in vivo in humanskeletal muscle by means of 31P NMR. Magn Reson Med1984;1:307-15. Jeneson JAL, Nelson SJ, Vigneron DB, Taylor JS,Murphy-Boesch J, Brown TR. Two-dimensional 31P-chemical shiftimaging of intramuscular heterogeneity in exercising human forearm muscle. AmJ Physiol 1992;263(2 Pt 1):C357-64. Wiesner R, Ludwig P, Schewe T, Rapoport SM. Reversibilityof the inhibition of cytochrome c oxidase by reticulocyte lipoxygenase. FEBSLett 1981;123:123-6. Bakker HD, Scholte HR, Bogert C van den, Jeneson JAL,Ruitenbeek W, Wanders RJA, et al. Adenine nucleotide translocator deficiencyin muscle: potential therapeutic value of vitamine E. J Inherit Metab Dis1993;16:548-52. Bakker HD, Scholte HR, Jeneson JAL. Vitamin E in amitochondrial myopathy with proliferating mitochondria letter.Lancet 1993;342:175-6. Argov Z, Bank WJ, Maris J, Peterson P, Chance B.Bioenergetic heterogeneity of human mitochondrial myopathies: phosphorusmagnetic resonance spectroscopy study. Neurology 1987;37:257-62. Chance B, Sies H, Boveris A. Hydroperoxide metabolism inmammalian organs. Physiol Rev 1979;59:527-605. Bij ischemie komt zuurstof niet meer in de cellen en kunnen de mitochondriën geen ATP meer maken. Dit is de belangrijkste oorzaak van mitochondriaal falen bij de mens. Ook zijn er patiënten bij wie de weefseldoorbloeding in orde is, maar bij wie de mitochondriën toch onvoldoende energie maken. Biochemische diagnostiek van deze patiënten is het doel van ons onderzoek. Door het vinden van de afwijking kan de patiënt een rationele therapie worden geboden, die soms succes heeft. De meest voorkomende mitochondriale defecten zijn samengevat in tabel 2. Het totaal aantal ontdekte mitochondriale enzymdefecten bedraagt thans 65, en elk jaar komen er een paar bij. Behalve deze (veronderstelde) primaire mitochondriale ziekten, veroorzaakt door een genetisch defect in een mitochondriaal enzym, zijn er veel secundaire mitochondriale ziekten, veroorzaakt door een gebrek aan een component die essentieel is voor de mitochondriale functie, of door een remming van die functie. Dit kan veroorzaakt worden door ondervoeding, stoornissen in de hormoonhuishouding of de circulatie, bacteriële of virusinfectie, vergiftiging of een extramitochondriale primaire afwijking. Als de mitochondriale ATP-synthese eenmaal is geremd, kunnen verdere mitochondriale stoornissen worden gegenereerd door de mechanismen van mitochondriale doem: veranderingen in de membraanturnover, vorming van mitochondriale antilichamen, accumulatie van ionen (Ca2) of intermediairen (zoals acyl-CoA, zelf weer een belangrijke oorzaak van carnitinedeficiëntie), opraken van Krebs-cyclus-intermediairen en toename van vrije radicalen en lipideperoxydatie.